As the people of Bahrain mark the third anniversary of the 2011 uprising, decision makers across the west need to reflect on their role in exacerbating tensions and facilitating repression in the country. Incredibly, the UK defends its relationship with the Bahraini regime by claiming that they have “made progress in addressing the human rights concerns”. This is despite the collapse of reconciliation talks in the country and condemnation from a range of human rights groups and NGOs. The breakdown of dialogue has been symptomatic of wider problems with the undemocratic and abusive ways in which the government operates. Against this backdrop, the UK has only strengthened its relationship with Bahrain and invested a lot of time and money into very publicly attempting to secure a deal on Eurofighter jets. The UK’s relationship with the Bahraini regime was arguably embodied by the tasteless events of GREAT British Week, a week of celebrations that took place shortly after talks ended to mark what organisers called 200 years of ‘friendship and strong bilateral relations’ between the two countries. The week saw a 250-strong British delegation descending on Bahrain; including Prince Andrew, Philip Hammond, the Secretary of State for Defence, a host of weapons companies, such as Rolls Royce and BAE, and even a big red London bus. The scenes of circus-like festivity were far removed from the experiences of the Bahraini citizens on the receiving end of government-sanctioned abuse. Since then the king of Bahrain, bolstered by his international support, has increased the repression by introducing a law that imposes jail sentences of up to seven years and a fine of up to 10,000 dinars ($26,500) on anyone who publicly insults him. GREAT British Week was not an isolated event, it was only the latest in a long line of events promoted, or held, by the UK government to strengthen their relationship with the dictatorship. 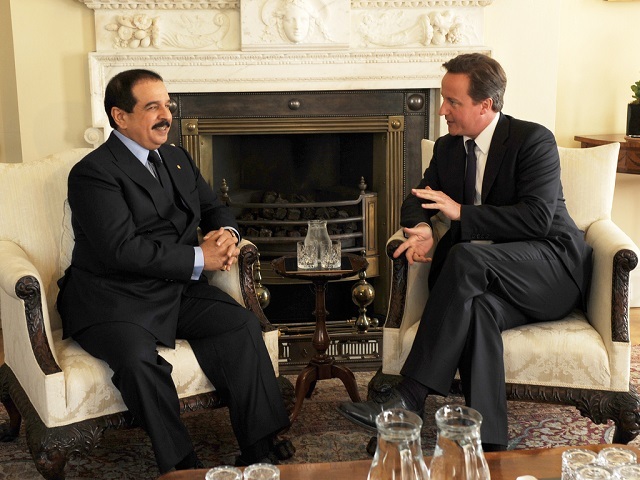 David Cameron has met with and hosted the Bahraini rulers a number of times, most recently in 2013 when the Bahraini King visited him in Downing Street. Following the meeting Cameron continued to talk-up the possible deal over Eurofighters, but stayed silent on human rights. The support of the UK has boosted the legitimacy of the Bahrainis abroad, but it has also had an impact on the politics of the Foreign & Commonwealth Office (FCO). This political support has been reinforced by military support, with the UK having sold large quantities of weapons to the regime. The most recently published figures from the Department of Business, Innovation and Skills show that since the uprising, the UK has licensed almost £40 million in military and dual-use exports to Bahrain. These have included assault rifles, explosives, pistols, naval guns and sniper rifles. The UK is not alone in aligning with the tyrants and ignoring human rights concerns. The most recent European arms exports report, which covers licences for 2012, shows that during the year of the uprising EU member states licensed €31 million worth of weapons to the Bahraini regime. In 2012, despite the deteriorating human rights situation, this figure increased by over 150%, resulting in almost €80 million in licences. The nature of these relationships has muted criticism from the west, and ensured that pro-democracy activists in Bahrain are campaigning in an environment characterised by violence, intimidation and repression. As the situation continues to escalate we can be under no doubt that decisions being made in the name of arms trade profits are having serious consequences for the victims of the terrible regime. Without justice there can be no peace in Bahrain, and this can’t happen while governments in the west continue to provide support for the regime. Last month the Stop The Shipment campaign succeeded in stopping a huge shipment of South Korean tear gas canisters to Bahrain. Following an international campaign DAPA, South Korea’s arms export licensing agency, announced that due to political instability and pressure from international rights groups it will cease all tear gas exports to the Bahraini dictatorship. This has set a precedent that needs to be built on with a European-wide embargo on all future arms sales to Bahain. Only by ending the political and military support that is strengthening the regime can we ensure that when the next anniversary of the uprising comes the outlook for human rights and the prospects of Bahraini citizens will be stronger than today.